Arnott’s, owner of many a biscuit and cracker, have released a new snack to the tune of that very icon. The Vegemite and Cheese flavoured Shapes have been released in stores using five Australian celebrities to advertise them on TV. 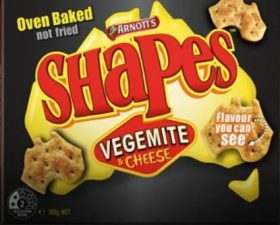 The Shapes are made in the shape of Australia, but in a statement on its website, Arnott’s explained why it had to leave Tasmania out of the cracker. “Tassie, we’re not over it. Our break up that is. 10,000 ish years ago, you decided to part ways with the rest of our country which really hurt, ’cause you’re just so naturally abundant and beautiful! Here at Arnott’s, we believe in real connections, and whilst we literally tried to keep you connected, we just got the feeling you’re not quite ready to come back to us*. Call us. It’s not you, it’s us.